With the new racks of IBM, BSC becomes the first supercomputing center in Europe to offer access to the same technologies of the brand new Summit, the most powerful supercomputer in the world. MareNostrum 4 supercomputer has incorporated into production three racks of last IBM POWER technologies with a peak performance of 1.5 petaflops. With this incorporation, the Barcelona Supercomputing Center (BSC) aims to explore the high expectative of this technology to accelerate Artificial Intelligence–based research. 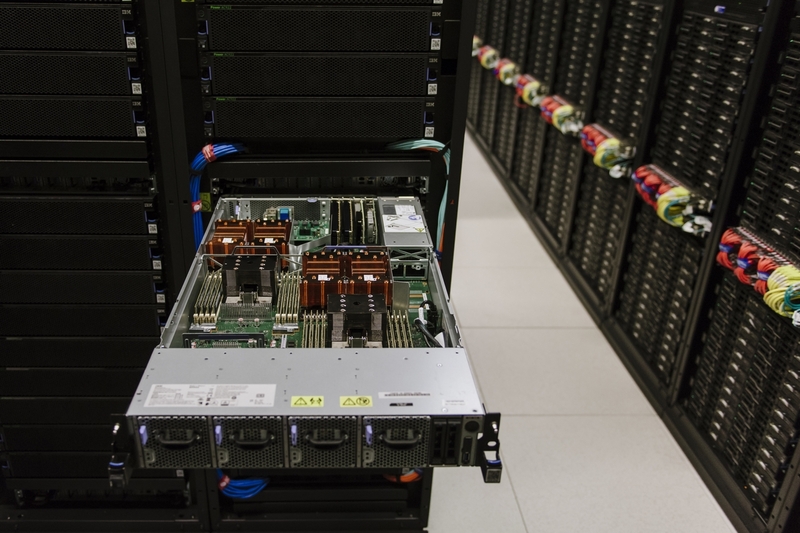 With the new POWER9 – Volta GPU racks, Barcelona Supercomputing Center (BSC) becomes the first supercomputing center in Europe to offer access to the same technologies of the brand new Summit supercomputer, with which the US has snatched from China the throne of the most powerful supercomputer in the world. Mateo Valero, director at Barcelona Supercomputing Center states to have “expectations that IBM POWER Systems will help BSC accelerate MareNostrum’s ability to advance research in personalized medicine, deep learning, and AI applications”. The new 3 racks, formed of 54 IBM Power Systems AC922 servers, have a peak performance of 1,48 Petaflops, a 50% more than MareNostrum 3 supercomputer, which was uninstalled just one and a half year ago and had a performance of 1,1 Petaflops. On Linpack benchmark the cluster obtains 1,01 Pflops, using 85,8 Kw, for 11,77 Gflops/watt, and on HPCG benchmark is 28 Tflops using 27,48 kw, for 0,59 GFlops/watt. MareNostrum 4 is an heterogeneous supercomputer entirely aimed at generating scientific knowledge and innovation. It is formed by a main block for current research workloads and three blocks of emerging technologies that are being added and updated as they become available. The main block, formed of Intel Xeon Platinum chips with a performance of 11,15 Petaflops, begun operation in July 2017. POWER9 racks are the first block of emerging technologies that has been installed. IBM delivered them on the 29 of December and they started operation in May 2018. The aim of gradually incorporating emerging technologies like POWER9 into MareNostrum 4 is to allow BSC to experiment with what are expected to be the most advanced technological developments over the next few years. The goal of the center is evaluate which applications will get a better cost / performance ratio in each architecture and its suitability for future iterations of MareNostrum. The 3 new racks of MareNostrum 4 are formed of 54 nodes of IBM POWER9 processors. Each node has 2 Witherspoons processors (with 20 cores of 3,1 GHz each), 4 Volta NVIDIA GPUS (with 16 GiB each), and 6,4 TB of NVMe (Non-Volatile Memory). The three new racks have 30,7 Terabytes of main memory, 207 Terabytes of SSD storage, 345,6 TB of NVMe, and the different nodes are connected to each other with a high speed Mellanox EDR network, and interconnected to BSC file systems allowing MareNostrum to handle large, complex data sets and models. Built from the ground-up for the most demanding workloads like deep learning and AI, IBM’s new POWER9 processor includes the latest IO subsystem technology to accelerate the most data-intensive workloads. MareNostrum 4 has been built by IBM with key industry partners. When completed, will have a performance capacity of 13,7 Petaflops.